Nursing is one of the most rewarding career paths a person can choose. In the last couple of decades, critical tasks have been shifted from doctors and performed by nurses, making nurses more valuable members of the medical profession. So how does someone become a nurse? 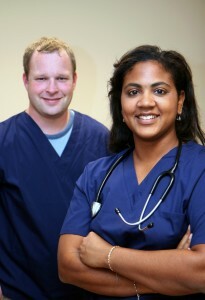 Below we cover the basic steps needed in order to start achieving your goal of becoming a nurse. Some nurses, such as Emergency Nurses, act well under pressure and have incredible bedside manner while dealing with grieving loved ones. They want to be in the heart of hectic situations and they thrive in high-energy scenarios. Or perhaps you want to use your knowledge about nursing to help hospitals and insurance companies hold people more accountable by using your expertise to audit paperwork and procedures. There are award-winning programs all over the country that can provide an outstanding nursing education. What you need to do is determine what program best fits your life. A mother with a day job may find it easier to take most nursing classes online. As a nursing student at any one of the many accredited programs in the U.S., you will learn about the human body, about the specialty you’ve declared, and all about the medical industry, including important laws and regulations. Working hand in hand with doctors and helping patients feel better every day are just two reasons that many people are entering the nursing field. All you need to do is figure out what you want out of your nursing career, find the right program, and work hard to make sure you become another valuable member of the medical industry. This entry was posted in General on December 11, 2014 by np.